350 MILLION PLAYERS CAN’T BE WRONG! • 220+ OFFICIAL SPEED MACHINES: Ferrari, Ducati, Lamborghini, McLaren, Bugatti, Mercedes, Audi, Ford, Chevrolet… From bikes to cars, we got ‘em all! • INTENSE ARCADE GAMEPLAY: Feel the thrill of gravity-defying racing across 50+ high-speed tracks! • HIGH-OCTANE MULTIPLAYER EXPERIENCE: Race in real-time multiplayer action for up to 12 opponents & dare your friends to ghost races! Embark on a new quest for the hottest rides! Welcome the Spyker C8 Preliator: a striking, 600-horsepower beauty with a full carbon body. The perfect ride for aficionados of precision driving—now with its own dedicated Championship! The first highly efficient hydrogen-powered race car in the world—and it’s yours to experience! The Pininfarina H2 Speed is waiting for you in an all-new R&D Event. A premier muscle car is speeding into your garage. 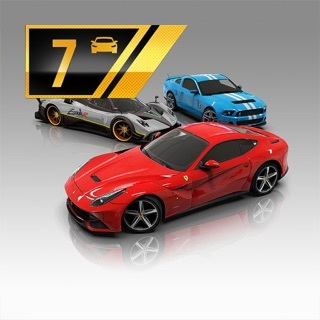 Win the Equus Bass 770 in an exclusive new Championship! Feel the power of the beast! Don't miss the Rezvani Beast X in the upcoming R&D Event; this Class-A ride won't be here for long! We're making significant improvements to the way our inventory system works! Navigating the new inventory is much easier, and it's better structured to help you find what you're looking for. Conquer street and sky in Gameloft’s fastest racing game yet, a mix of high-octane driving and incredible jumps that harkens back to the age of San Francisco Rush and classic Burnout. Pairing white-knuckle action with an array of career and online modes, it sets a new standard for arcade racers on the App Store. When I saw ads for this game, I really wanted to try it out, so I downloaded it and was instantly impressed. The beautiful graphics and UI just blew me away! The entertainment this game brings will make play it for hours at a time. However, all great games aren’t perfect. It is very hard to progress in this game, as cars either cost too much, or the blueprints for them are too rare. 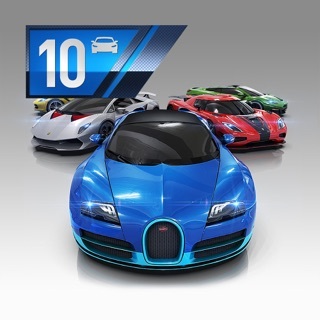 Finding 40 blueprints for a single car really just isn’t worth it, so can this maybe be nerfed GameLoft? Also, bugs... though they can be hard to find, they really can annoy someone after a while. For example, when I am racing online, the momentary invincibility after a wreck will sometimes stay on other racers, making it impossible to knock them down. Another example, in multiplayer, when the cars start, some of the other user’s cars wont move, grinding you to a sudden halt, but then they teleport forwards, putting you in nearly dead last. One more bug that ticks me off, where you respawn after wrecking. One time on the map “London Eye” I was knocked down in midair during a jump over a river. I kept respawning right in front of the ramp and couldn’t build up enough speed to make the jump, making an endless loop of me crashing. Though these bugs tick me off, I still love the game, and will keep playing it for a long time, despite the minor and sometimes major annoyances that pop up. Keep up the good work GameLoft! Gotta be real, loved this game at first, until I realize the ratio of winning credits/receiving tokens to the amount I’m required to spend to really get anywhere and/or buy the cars I need. I won’t ever spend money on iAPs when the app itself is free, or at least make it more reasonable so I’ll just keep replaying the same races 100s of times 😜. Even the extra nitrous, extra credits for one day, performance upgrades right before your race starts is way too expensive. You guys really need to chill out and stop being money hoggers. Also, with this newest update, how does AI manage to catch up to you without using nitrous, pass you, and maintain the lead when you yourself have a maxed out car and on nitrous? That to me makes no sense at all. It’s as if you guys improved the ‘physics’ and added a little magic to AI, to make us work for the impossible and then force us buy iAPs when that shouldn’t even be possible IRL. I’ve also had a multiple times where AI purposely crash into the wall, then the car bounces off and flies toward the opposite way, and you’ve got no chance to avoid it and you end up crashing too. Not only do they crash, when you attempt to knock them out during stronger NOS, they somehow resist, then all of a sudden turn and you both end up crashing on the sidewall with no chance of you recovering. That was never the case before the update. Come on guys, be realistic.